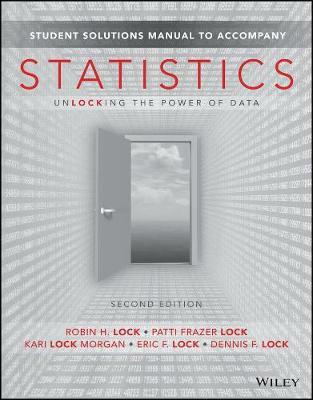 This is the Student Solutions Manual to Accompany Statistics: Unlocking the Power of Data, 2nd Edition. Statistics, 2nd Edition moves the curriculum in innovative ways while still looking relatively familiar. Statistics, 2e utilizes intuitive methods to introduce the fundamental idea of statistical inference. These intuitive methods are enabled through statistical software and are accessible at very early stages of a course. The text also includes the more traditional methods such as t-tests, chi-square tests, etc., but only after students have developed a strong intuitive understanding of inference through randomization methods. The text is designed for use in a one-semester introductory statistics course. The focus throughout is on data analysis and the primary goal is to enable students to effectively collect data, analyze data, and interpret conclusions drawn from data. The text is driven by real data and real applications. Students completing the course should be able to accurately interpret statistical results and to analyze straightforward data sets.